It's no secret that having combination skin is pretty much the bane of my existence! Over the past couple of months I feel like I've got things under control so wanted to share with you the products that helped with that. As a general rule I find that in the morning and in the evening, using one hydrating product and one blemish-reducing product really works for me. So if I'm using a mattifying moisturiser, I make sure to put a hydrating serum on underneath. If it's nighttime and I want a really moisturising mask then I'll ensure I use an anti-blemish treatment beforehand. I also like to ensure that when I do opt for anti-blemish treatments, they're not going to be stripping or overly drying. Overly harsh products aren't going to do your dry patches any favours! This is just the best face mask for combination skin because it has this really runny, hydrating honey-like formula and is packed full of fruit oils. It doesn't dry onto the skin like a clay mask would, your skin just starts to absorb it over the 10-15 minutes you leave it on. I find it so light yet nourishing. The amazing thing about this is that the natural antibacterial properties of honey make this amazing for keeping breakouts at bay. It's one of those products you can really use as much as you like because it's so gentle and natural. When this arrived, I have to say I wasn't convinced that it was going to be for me as I've previously found a lot of gel cleansers to be overly drying (I have a lot of bad teenage memories...) However this actually has a very fluid consistency and doesn't foam up too much, which I like. It also contains Avene's Thermal Spring Water for extra hydration. I feel like this really cleanses my skin of any grime and dirt without leaving it feeling stripped of moisture. I've really noticed a difference in my skin since using this; a lot of the annoying little whiteheads I get are kept at bay. Since I purchased this, I haven't looked back once and actually, despite using this every single evening (more or less) for the past year I'm only on my second bottle so it's a worthwhile investment. It also contains the magic ingredient of Manuka Honey along with zinc to reduce blemishes. I love how the clay absorbs any excess oils on the surface of my skin and just feels so nice to use, however it doesn't remove any moisture from my skin. This is a long-time favourite of mine but deserved another mention! It's a fast absorbing formula that gives my skin a nice semi-matte texture. I personally use it like a serum before a moisturiser when I'm breaking out. It's amazing at getting rid of spots quickly without feeling too harsh. Again it contains the Thermal Water that ensures you're getting a hydration boost whilst fighting your blemishes. This is the moisturiser I really recommend for combination skin. When you're breaking out, I know the temptation is to skip moisturiser but no matter how oily you are; it can be counter-productive to starve your skin of hydration. This is the perfect balance of moisturising and mattifying. It adds some hydration but I still feel it gives my skin that shine-free, healthy satin finish. I wouldn't say it will get rid of your spots on its own but it works really well with the Avene Cleanance Expert when you're breaking out. I've also realised that unless it's the depths of winter; really rich creams don't work for me. They tend to sit on top of my skin and cause excess shine and breakouts instead of sinking in and nourishing it. Instead I opt for gel and water-based formulas, as they are extremely hydrating but will absorb really well. This is another product I've been a big fan of for a while. It's one of the few skincare products I'd genuinely recommend for any skin type. It's a fine, really hydrating and refreshing face mist. I often use it in place of a toner but you can even use it on top of makeup. This Thermal Water just adds instant relief to any dryness and just absorbs right into the skin. This is one of my all-time favourite skincare products! It's a very fluid water-based serum that gives me such amazing hydration whilst sinking into my skin really quickly. It's the perfect alternative to a heavier cream but gives you all the hydration without clogging up your pores. This is my favourite moisturiser for the summer months because it really gives me that hydrated (juicy, even?) skin whilst being virtually traceless. It's a gel-based formula so just sinks right in without being heavy in the slightest. It's packed full of vitamins and gives my skin a really healthy appearance. I've realised that over-using more intensive treatments can cause more problems than they solve. However I've picked out a couple that are a little stronger but aren't going to aggravate blemishes or be too harsh on any dry patches. This is the perfect 'starter' AHA. My skin is too sensitive for something like the Alpha-H Liquid Gold but this is just right, giving me the desired effect whilst being gentle enough to use a few times a week. It's full of glycolic acid, along with soothing aloe vera and also witch hazel. It's a chemical exfoliant so will help buff away any dry patches as well as fading those old blemish scars and revealing a healthier complexion. Tea Tree oil is one of those ingredients that's just guaranteed to get rid of my spots overnight. I soak a cotton wool bud in this and dab it on the problem areas. It is very invigorating, however it gets rid of the spots without drying out the area. I know there's a temptation to stay away from face oils if you have blemish-prone skin but there are some that really work and this is one of them. How do you balance out your skin? *DISCLOSURE - PRODUCTS MARKED WITH AN ASTERISK ARE PR SAMPLES/GIFTS. ALL OPINIONS ARE MY OWN. I have combination skin and it can be so super annoying at times - I really want to try the Pixi Glow Tonic, as I've heard so many good things about it, I get really dry patches around my nose so maybe it'll help to balance that out! I really want to try the Vichy Aqualia Thermal Serum, I believe serums are inevitable when it comes to deep hydration without any greasiness! 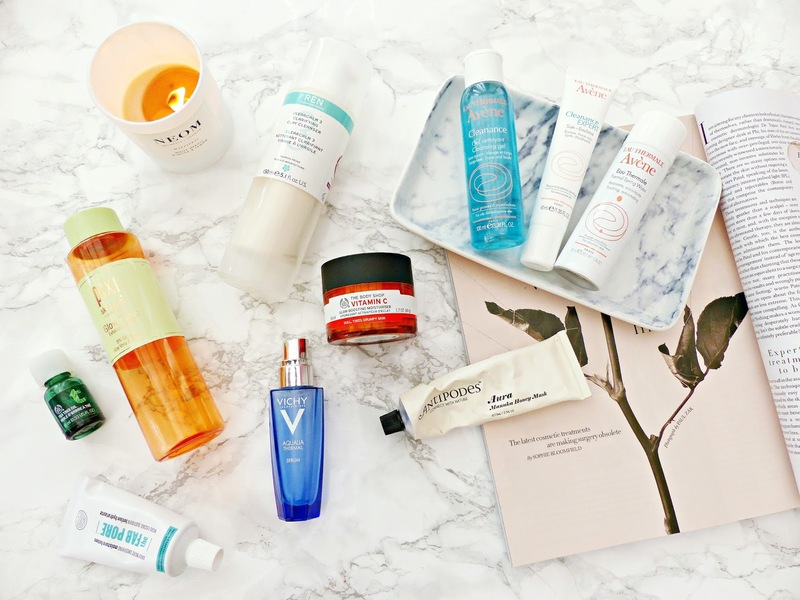 I really need to try products from Vichy and Avene both sound amazing! I find my skin such a problem- I have realy dry areas and realy oily areas so it's really hard to find any kind of cream or serum that doesn't feel like its sufficating my skin! I might try some of these to see if they work! My combination skin is a nightmare! Espiecially as the weather changes, my skin just can't make up it's mind! I am intrigued in the honey mask and I think I might actually give it a go! I love your blog it's so sweet and nifty. I hope you'd have a look at mine! Tea Tree oil is literally a skin lifesaver - it never fails to make my skin clearer! Clay masks are so good as they absorbs any oil or moisture which maybe be on the surface of your skin! That one by REN sounds really good! I recently have combination skin which I'm not used to having. I'll definitely have to try some of your recommendations! So many of my favourites here! The Avene Cleanance range is the best! Loving the sound of the REN cleanser too! Thanks for these recommendations, choosing products for combination skin is a challenge! Thanks for the recommendations! I have more oily skin than combo skin, but you've suggested some great products! I'm going to try to pick up the Soap and Glory moisturizer! Hi Jasmine! I don't really have blemishes but my T zone tends to be oilier than the rest of my face, but still not too oily as to consider my skin as "combination". You mentioned some products which are currently in my Wishlist, like the Vichy serum and the Ren cleanser, though I'm a bit afraid that this may dry my skin up a bit, my biggest fear with cleansers. I would highly recommend you to try the serum Hydraluron when you run out Aqualia, I think it does the same thing and I love it. The Antipodes mask has become my favourite mask ever, I don't see the anti-blemish effect but it's very soothing and nourishing on my skin :) Have a great day!